Two people were injured in a two-vehicle crash on Interstate 93 in Salem, New Hampshire, on Monday morning. 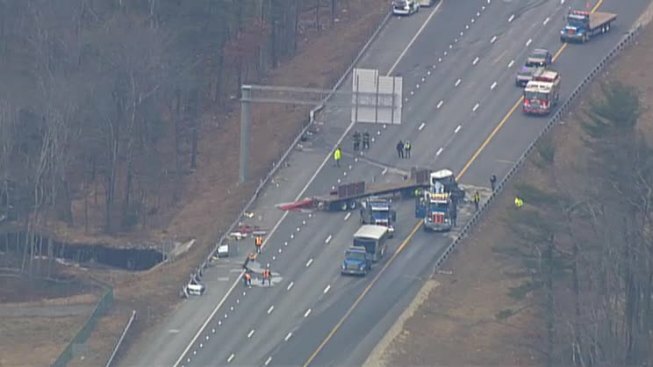 According to New Hampshire State Police, a 2002 Nissan Sentra driven by Matthew Torbin, 21, of Derry, was entering I-93 south from the exit 2 on-ramp in Salem around 10:49 a.m. when it collided with the passenger side of a 2012 Freightliner Flatbed truck operated by John Pothier, 57, of Billerica, Massachusetts. Pothier lost control of his truck and it rolled over across four lanes of travel. Torbin had to be removed from hsi vehicle by firefighters. Both Torbin and Pothier were taken to Lawrence General Hospital. Torbin suffered serious, but not life-threatening injuries and Pothier suffered a minor head injury. I-93 south was shut down for about 2 hours, with traffic re-routed off exit 2. The highway reopened around 1 p.m.